Phil Mickelson plays his shot from the 12th tee during the final round of the AT&T Pebble Beach. On a wild day of weather even by Pebble Beach, Calif., standards, sunshine gave way to a hail storm that covered the greens in a sheet of white in a matter of minutes. 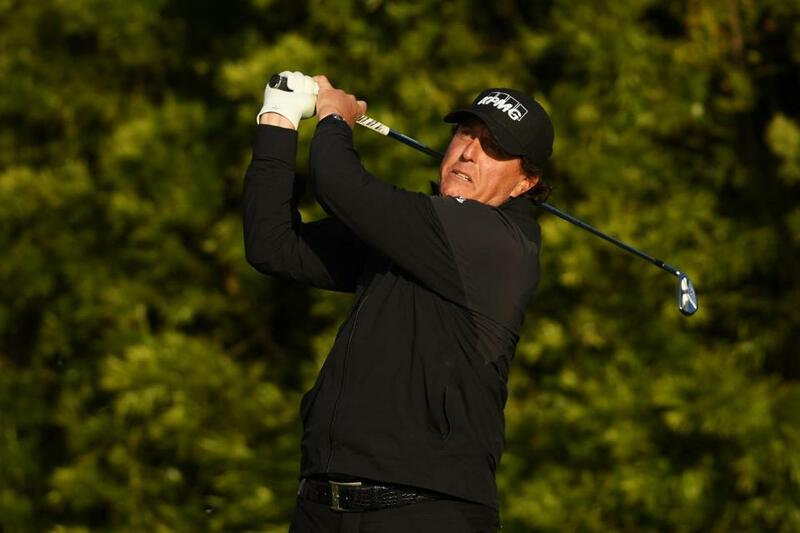 The delay kept Mickelson from finishing off a remarkable rally in which he turned a three-shot deficit against Paul Casey into a three-shot lead until it was too dark to finish the last two holes. Casey simply couldn’t see, and we realized it was not possible to finish all 18 holes — ‘‘We can’t finish two holes in six minutes,’’ he said to the official — he opted to mark his ball on the 16th green. Casey has a 3-foot par putt to stay three shots behind when they return at 8 a.m. local time Monday to play the par-3 17th and the par-5 18th. Casey was at 15 under, tied with Scott Stallings, who closed with a 66. Along with an outside chance at forcing a playoff, finishing alone in second instead of a tie is a difference of $152,000, along with world ranking points and FedEx Cup points. Casey and FedEx executive Don Colleran had a one-shot lead in the pro-am. Champions — Bernhard Langer made himself right at home in the Oasis Championship in Boca Raton, Fla. Playing 10 minutes from his house, Langer closed with a 7-under 65 at The Old Course at Broken Sound for a five-stroke victory. The 61-year-old German star birdied five of the first seven holes in a bogey-free round. Langer finished at 19-under 197 for his 39th victory on the 50-and-over PGA Champions Tour event. He also won the 2010 event and finished second last year. Scott McCarron (67), Gene Sauers (69) and Woody Austin (70) were 11 under. LPGA/European — Celine Boutier of France claimed a two-stroke victory in the LPGA’s Vic Open in Barwon Heads, Australia. On the same course, Scotland’s David Law made eagle on the par-5 18th to win the men’s European Tour event title by a stroke over Australians Brad Kennedy and Wade Ormsby.